This service is offered by our team of professionals as a small package of cab rental services. This is dedicated to for Kashmir trip, mainly for local city usages. You can avail this service any time you wish to through online website of our services. The Local Full Day service will be available for a variety of local trips including sightseeing, shopping, attending meetings, seminars, visiting hospitals, and a lot more. This is a mini package service for local city tour usages. We offer this service for half day car hire services including Airport Transfer in Kashmir, Car rental service for Marriage, party and event, Corporate Cab Rental in Kashmir, Railway Transfer, visiting hospitals and a lot more. The service is highly useful for travellers who wish to avail pickups and drops facility from one destination to the other such as airport pickups and drops, hotels pickups and drops, railway station pickups and drops, and bus stand pickups and drops. We make double sure that the chauffeurs reached the appointed destination in time. At My Taxi India, we offer special packages for outstation travel. These are a perfect choice for weekend getaways, trip with friends, excursions, and family leisure trip outside the city limits. Here, we will take special care of your interests and requirements before arranging for a package. We also arrange for group packages from Kashmir to places nearby. The cars sent across will accommodate group size to ensure maximum convenience. This is an emblematic to and fro service in Kashmir for those interested in making to and fro trip to Kashmir. The service is available for multiple destinations from Kashmir. The package has been fashions one way service to those who require one way drop to their destinations from Kashmir. The packages listed above are designed keeping in mind specific requirements of Kashmir travellers. We also offer special Kashmir city sightseeing tours and any other customized cab rental packages. 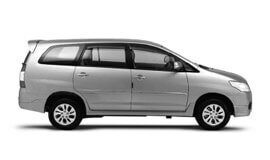 At My Taxi India, we guarantee the best car rental services in Kashmir at highly affordable prices. Kashmir enjoys weather similar to that of Europe, because it can rain any time in any season. The climate can be divided into four seasons, namely spring, summer, autumn and winter. Autumn and winter season are full of excitement and chill. Autumn comes with beautiful dry, yellow and reddish leaves. The entire valley is wrapped in a beautiful white blanket of snow during winter. Presently, division of Jammu and Kashmir has a total population of 12,541,302 million residents. The major economy of the state of is centred around agriculture. The state attained immense popularity when Cashmere wool was exported to other regions and nations. Till date, knitting and making Pashmina shawls, rugs, silk carpets, kurtas, and pottery make for the major source of income for most Kashmiris. Saffron, the most expensive spice is grown in Kashmir. Srinagar is known widely for its papier mache, silver-work, wood-carving, and the weaving of silk. The beautiful vale of Kashmir provides immense scope of pleasure and adventure tourism. There are a lot of high altitude alpine lakes with no access by any transport. These lakes include Nundkol Lake, Vishansar Lake, Tarsar Lake, Gadsar Lake, Satsar Lake and etc. some of the best places to visit in Kashmir include Tulip Garden, Gulmarg, Pahalgam, Kokernag, Dal Lake, Sonamarg, Betaab Valley and a lot more.